There are various issues and land related matters which are usually very complicated and require both the investment of time and money from an individual. Because of the development of online portal called a Banglarbhumi, these matters have become very easy to handle, as well as it has resulted in decreasing the ambiguity related to these matters. One of the matter related to land is mutation which is defined as the change in the ownership title from one person to another when the property is sold or transferred, this helps the government to collect tax from right person. The fee and the process of mutation may slightly vary from state to state. In the state of West Bengal, the land and land reforms department provides the facility to apply for Banglarbhumi mutation application. The form is available at the land and land reforms department or it can be downloaded from the official site of www.banglarbhumi.gov.in . There are multiple documents and information required while applying for mutation online application, one needs to be sure of the availability of information before applying for mutation application. Online portal for mutation has helped in avoiding the long queues for this purpose. One needs to be confident of the information while applying else the application may be rejected. After submitting the form, the applicant is provided with a receipt contain details like an application number, name of applicant, date and time of submission etc. this is provided by the employees of the department or the portal and is maintained by National Informatics center. NIC regularly maintains and updates the website from time to time. They also keep on flushing the unnecessary information from the back end. There is a feedback portion as well where the users can register their individual feedbacks, this helps ‘NIC;’ to improve the website from time to time. After opening the website one needs to click on the ‘online application’ provided at the top left of the menu. The form has multiple fields which the applicant needs to fill. Some of the fields are mandatory while some are optional. 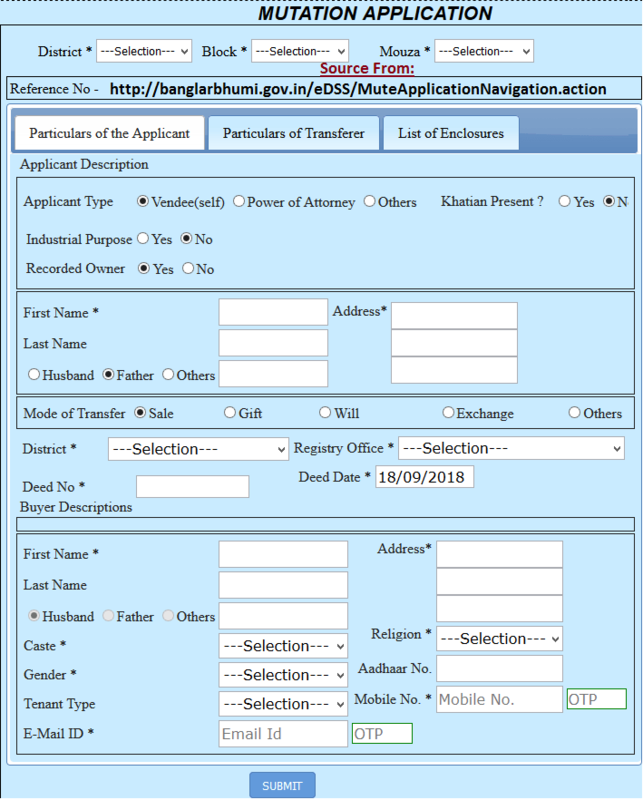 Mandatory fields include: District – one needs to select from drop-down, Block-one needs to select from drop-down, Mouza – one needs to select from drop-down, Applicant type, First Name, Complete Address, Registry office – one needs to select this from the drop down, Deed date and Buyer information (First name, Address, Caste, Gender, Religion and E-mail id and mobile number for OTP verification). Other than that user is also required to furnish some optional information, the applicant is also required to upload certain information like deed, rent receipts, declaration etc. Applicant should make sure that the information he has furnished is best of his knowledge else it might lead to cancellation of the form. 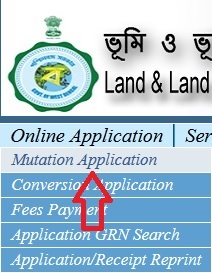 After filling the Banglarbhumi Mutation Application Form online, the next step is the payment of applicable fee. The user needs to click on the fee payment under online application. Online mode -If fees paid through ‘online mode’, user can do this through Net Banking / Debit Card option of GRIPS, after successful payment, Mutation Case Number will be registered immediately. Other Mode: If fees paid via ‘counter payment’ option of GRIPS then the applicant should goto Online Application -> Application- GRN Search to verify your payment and Register your case. In Case after successful payment through ‘online mode’ of GRIPS and no response came back to this end, then also use Online Application -> Application GRN Search to verify your payment and register the case. One should take a note of the application number as this would be used till the process of mutation is complete. PRESENTLY I AM OWNER A PROPERTY MEASURING 2 COTTAH AND 2 CHHITAK BUT SODEPUR BLRO OFFICE DID NOT ISSUE PORCHA ON TOTAL PROPERTY ONLY 0.46 MEASUREMENT HAS RECORDED IN MY NAME AND THEY SAID WE ARE UNABLE TO DO CHANGE THIS RECORD IN YOUR FAVOUR ON TOTAL PROPERTY. WHEREAS THIS PROPERTY HAS BEEN TRANSFERRED IN MY NAME BY A REGD.DEED IN THE YEAR 2013. KINDLY ADVICE ME HOW FULL RECORD/PORCHA WILL BE DONE IN MY NAME.